Elaine Hancock (Olney, United States) on 21 November 2012 in Plant & Nature. Most of the leaves are gone with just a few left with color. Elle ressort parfaitement de cet ensemble cette feuille jaune quelle iamge de saison sueprbe. A beautiful composition with marvelous colours and light. Color always attracts, doesn't it? Nice shot. great light and colors ! A beautiful Fall composition and I so like the verse Elaine, very nice!! Beautiful colors complemented by great play with sunlight and shadows here! So beautiful a piece of leaf. well found and capture. @Denny Jump Photo: Hi Denny, I hope that you have a wonderful Thanksgiving also. I think about all that has happened this year just to me and how thankful I am for so many things. One especially is our friendship. Hugs to you and Barbara. 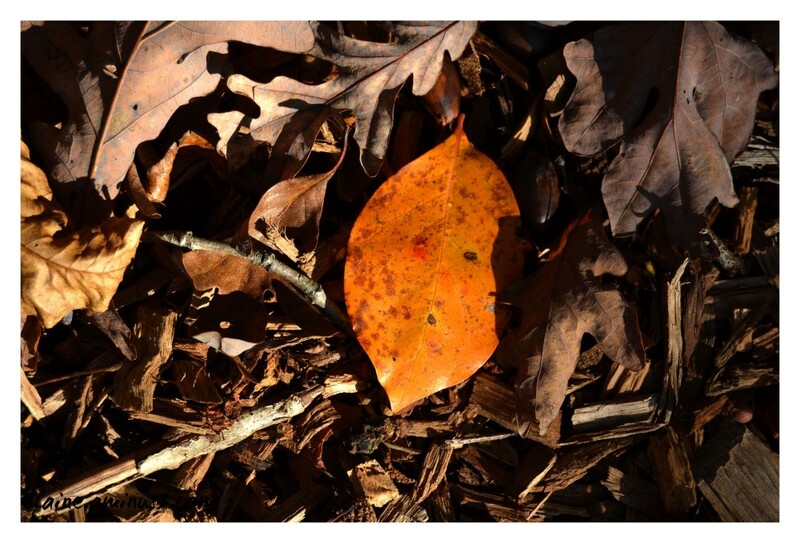 A fine image of this isolated leaf with the great color. Well done. A rose in the middle of the thorns. Not sure what that means in this picture but it came to mind. I love the lighting and the placement of the orange leaf. Beautiful collection of leaves and textures, beautiful and rustic! It is always a pleasure to see that last bit of color. It's the contrast that does it for me. I love that bright orange! Beautiful composition of leaves! The light is lovely and I like how this leaf pops against the rest.